After the brutal slaying of a close friend, Sarah King knows her only hope of staying alive is to secure the protection of the strongest alpha wolf in California, Lucas Simone. To get him to agree, however, is going to take a hell of a lot more than batted eyelashes and a "pretty please with sugar on top" plea. When she finally gets to him, sees him in person, the full meaning of the old adage of being caught between a rock and a hard place becomes painfully clear. Lucas exudes a raw sexuality that hits Sarah hard, makes her want and yearn, but he looks just as forbidding...if slightly less insane...as the one from whom Sarah is trying to hide. As a wolf, the wildest, most powerful, and often least mentally stable of all the shifter breeds of Other, Lucas is just as likely to hunt her as to help her. She's willing to trade information to secure his help, information about a rouge wolf encroaching on Lukas' territory. She hopes it's enough to warrant protection, because she has plenty of other information she plans to keep from him, secrets that would garner no sympathy - nor mercy, for that matter - from the intense wolf. Instead, they could go a long way to securing her death sentence, because just as it is clear to Sarah that Lucas wants her, there is no doubt in Sarah's mind what he'll do to her if he finds out that not even the danger posed by a wolf bent on killing him and taking his pack compares to the risk of Sarah herself. Some people say the truth will set you free. Sarah figures those people haven't had the hot breath of a feral wolf shifter wafting over the tender flesh at their throats...or felt the blazing passion of a possessive, clawed hand sliding over the bare skin at their hip. 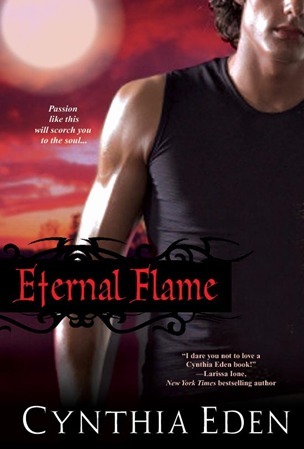 I've been enjoying Cynthia Eden's books for several years and particularly like the paranormal world she's created that encompasses the Midnight Trilogy and Night Watch series. It's a solid, well-developed, fully rounded-out world that includes all manner of beastie, called Other, living alongside humanity. One of the nicest things about that world is the familiarity it breeds, makes it easy to connect to the characters and get into the plot of a book, even across different series, without a lot of exposition dragging down the narrative. It's just a quirk of my nature that, despite that, I like to know where a book I read falls within existing series. Never Cry Wolf gave me a bit of a problem in that area. Conflicting information between a few different sites had me confused, but from the websites of Eden and the publisher, it seems Never Cry Wolf exists in the world of the Others, with closer ties to the Night Watch series than the Midnight Trilogy, but it seems to be more a followup of the book Immortal Danger, another novel that is loosely connected to Night Watch but not actually a part of that series. 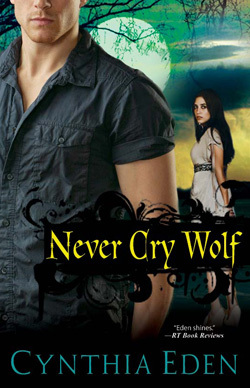 Characters introduced in Immortal Danger are featured in Never Cry Wolf, including one of the protagonists, Lucas Simone, and several points of the plot of Immortal Danger served as backstory in Never Cry Wolf. 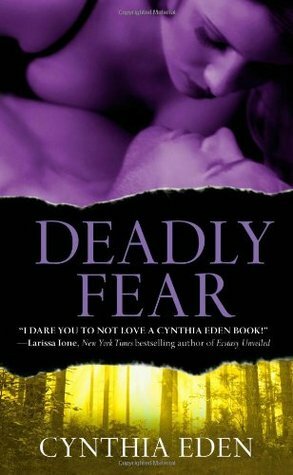 I think this book read well enough as a stand-alone, but I think I would've appreciated the latter half of the book more had I read Immortal Danger first. In typical Eden style, Lucas and Sarah are strong romantic leads, their relationship marked by lots of lusty yearning and plenty of intense emotion. It started hot and ramped up quick, and was peppered with the sort of heated back-and-forth dialogue that Eden does so well. It always seems part story development, part character foreplay and it's one of my favorite aspects of Eden's books. The plot was entertaining, and I especially enjoyed the first half, but the external conflict got a little muddy at about the halfway point. I wasn't thrilled with the plot threads that sprang from the introduction of the voodoo priestess and felt the story got a little out of control from that point on. I didn't dislike it, but it's not as cohesive as others I've read from Eden. Everything was a little too much. Sarah had a few too many secrets, there were a few too many attempted plot twists - and not all of them were completely successful. There were also a few too many coincidences, a few too many suspicious connections between secondary and ancillary characters... It just wasn't as clean and tight as it could have been. Still, the chemistry between the characters was intense, the characters themselves were well developed and likable, and - again, typical Eden - both the male and female protagonist are strong, independent characters who can hold their own. Sarah's physical strength doesn't match Lucas', of course, but she's got her own strengths and Eden never once let her need for Lucas' protection make it seem like Sarah was some weak damsel in distress. I still wish I'd read Immortal Danger before this one. I think it would have helped me with the characters that had obviously been previously introduced. 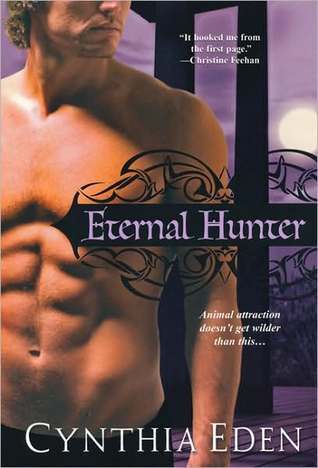 Though this book wasn't my favorite by Eden, I'm still a fan, and I plan to give Immortal Danger a read soon. Not only do I want to get more detail on the threads that got mentioned here as backstory, but I liked the vampire and her fire breather and look forward to a closer look at their story.